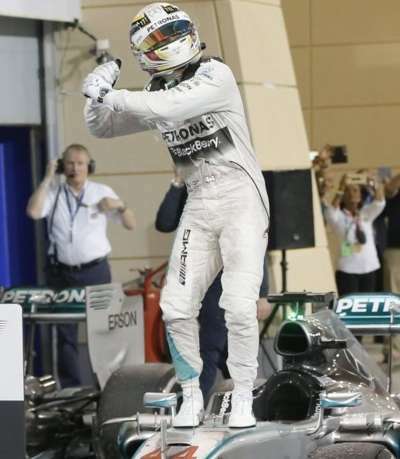 Lewis Hamilton has won the 2015 Bahrain Grand Prix from pole position after a race that drew to a stirring crescendo in the desert. Hamilton came home ahead of Kimi Raikkonen, whose inverted strategy allowed him to catch and pass Nico Rosberg for 2nd with 2 laps to go. The two Mercedes cars developed brake issues in the final laps which allowed Raikkonen to close in. Hamilton made an excellent getaway to lead down into turn 1, with Sebastian Vettel fending off an attack from Nico Rosberg into the hairpin. Vettel managed to keep Rosberg behind, with the second Ferrari of Raikkonen managing to capitalise to take 3rd around the outside. Having lost out initially, Rosberg soon set about trying to re-pass the Ferrari’s. On lap 3, Nico used the slipstream of Raikkonen to make a lunge into turn 1. Rosberg took his car all the way to the outside of the track on the exit to give Raikkonen no chance of getting back by. Racy Rosberg wasn’t done yet, as he closed in on Vettel and tried to pull off a move into turn 4 like he had attempted a year ago on his team-mate. This didn’t work, with Rosberg eventually pulling off an identical ‘block pass’ on Sebastian as he had done on Kimi into turn 1 previously. The pit-stops were soon under-way just after the 10 lap mark, with Sebastian Vettel the first of the front runners to dive in for new tyres. The team fitted his SF15-T with a new set of soft tyres, with the added grip proving enough to vault back past Rosberg when the Mercedes driver came in a lap later. Hamilton soon followed the pair in on the next lap, with the Briton emerging just ahead of their wheel-to-wheel battle on the start/finish straight. Rosberg regained 2nd, but was still behind his team-mate in the lead. Raikkonen was the last of the leading quartet to pit, but the team elected to put him on the longer lasting medium compound; contrasting the strategy of his team-mate and the two Mercedes drivers. He emerged just ahead of fellow Finn Valtteri Bottas in 4th, but he soon started to take time out of those ahead. Tenth-by-tenth, the gap was coming down between him and his team-mate, which was boding well for a late race challenge for him when he would be on the faster tyre. The final pit-stops arose with 24 laps to go, with Sebastian Vettel once again the first to pit as the team put on the medium tyres. This time, Mercedes elected to pit Hamilton before Rosberg. Hamilton emerged comfortably ahead of Vettel, but Rosberg was jumped once again; with Vettel setting the fastest lap of the race on Rosberg’s in lap. Vettel wouldn’t stay in front for long however, as the German went wide at the final turn which damaged his front wing fixings. Not only did Rosberg get by, but Vettel had to come in for a front-wing change which put him down in 5th place behind Valtteri Bottas. With one Ferrari’s podium challenge over, one was still in the hunt. Ferrari now had the lead of the race with Raikkonen, but he still had one pit-stop to go. The team kept Raikkonen out on track for a long stint on the medium tyres, with Hamilton regaining the lead before Kimi had even stopped. He finally came into the pits with 17 laps to go and rejoined 3rd. Rosberg was 16 seconds up the road from Raikkonen, with Hamilton a further 4 second adrift. Raikkonen soon began to charge, with the Finn setting several fastest laps in his pursuit. He was consistently over a second a lap faster than Rosberg and was decimating the gap between them. 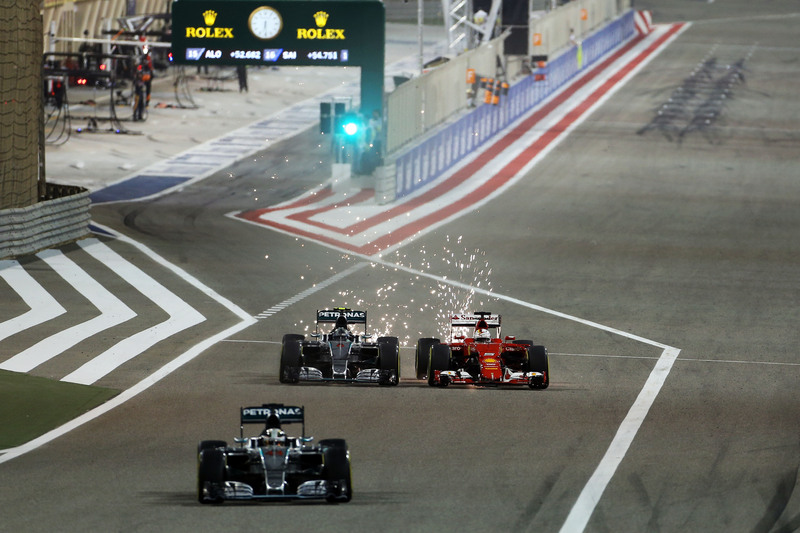 With 5 laps to go, the gap between Rosberg and Raikkonen was down to 3.7 seconds. The relentless charge meant that it was likely that Raikkonen would get by for 2nd place, but it was made easier at the start of the penultimate lap when Rosberg went too deep into turn 1, allowing Kimi to take the place. It turned out that both Mercedes cars had suddenly developed a brake-by-wire issue, meaning that their braking capabilities had decreased dramatically. Luckily enough for Lewis Hamilton, his now 6 second buffer proved enough for him to hold the lead to the chequered flag. 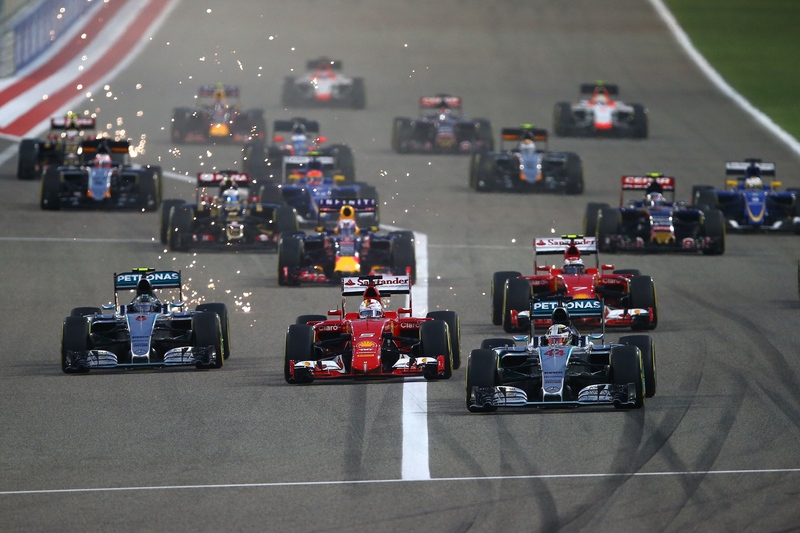 Hamilton crossed the line to take his 3rd win of the year and his second at the Sakhir International Circuit. Kimi Raikkonen took his first podium since the 2013 Korean Grand Prix and his first for Ferrari since the 2009 Italian Grand Prix. He came home ahead of Nico Rosberg, who was unsurprisingly disappointed that he had allowed a car to get between him and his team-mate once again. After falling behind due to his front-wing failure, Sebastian Vettel was stuck behind Valtteri Bottas’ in the Williams. He stayed on the back of his gearbox, but was unable to get by and had to settle for 5th. He still had a better race than his former team-mate Daniel Ricciardo, who came home 6th. Ricciardo crossed the line in dramatic style after his Renault engine gave way on the run to the line; filling the circuit with smoke as he pulled to a stop just over the finish line. Romain Grosjean took his second successive point finish for Lotus with a great 7th place ahead of Sergio Perez; who took his first points of the season at the site of his podium one year ago. Daniil Kvyat finally scored points after being plagued with mechanical issues thus far, with Felipe Massa taking the final points paying position after starting from the pit-lane. It was another mixed race for McLaren, with Fernando Alonso putting in a great race to finish just outside of the points in 11th, with Felipe Nasr similarly having a great race to take 12th after many excellent overtakes in his Sauber. 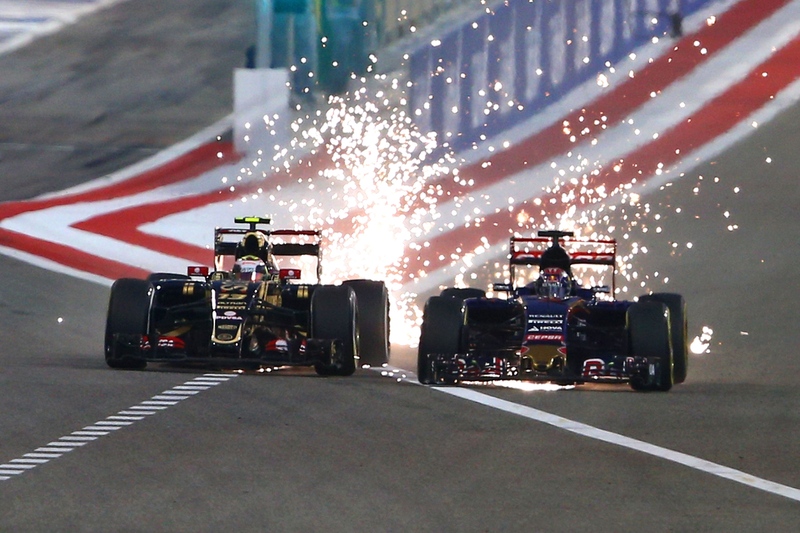 Pastor Maldonado had a dramatic race for Lotus, with several off-track excursions and very hot brakes almost causing the Venezuelan to retire for the 4th race in a row. The team managed to get him back out on track, but he only finished ahead of the two Manor drivers, with Will Stevens and Roberto Merhi both impressively finishing the race once again. Three drivers failed to finish, with Toro Rosso having a torrid day after both Sainz and Verstappen retired with mechanical issues. Jenson Button joined them on the sidelines after failing to even take to the grid after an ERS failure for his McLaren Honda.